I knit because I must. Don’t get me wrong, H doesn’t stand over me every night feeding me Tunnocks teacakes as he sternly admonishes me to knit on, knit faster, knit stronger, recent casualties of long use/the washing machine having led to his fluffy sock collection being reduced to a shocking three week supply. Well actually the Tunnocks might not be too far from the truth. 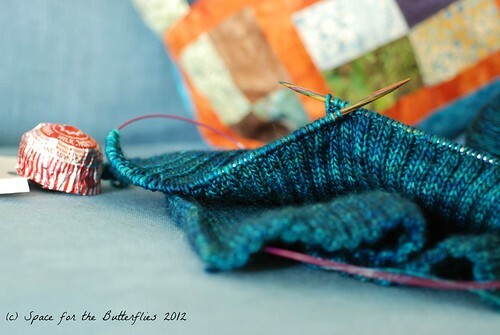 No, I knit because without it I twitch, I fidget, and my subconscious takes a flying leap into overdrive. Knitting, even complicated difficult things that I can’t figure out, soothes my soul and shows me that at the end of each day, when all I’ve achieved at work is a pile of paper, and all I’ve got done at home is now undone, I’ve made something that can stay that way. Well unless I’ve made a mistake and need to rip it all out again, but the less said about that the better. My needles are currently occupied by what could quite conceivably be considered some of the most boring knitting ever. I’m making Kate Gilbert’s Mama Snug from an old Interweave Knits, and aside from a few twisted cables on the ribbing and around the neck, and the clever short rows that make this a functional maternity jumper, it’s a 2×2 rib long sleeve jumper. For a 6’0″ girl with fairly long arms and a sizable baby bump. That’s a lot of ribbing. But somehow the continuity is showing me what I suspect I already knew. I’m on the back at the moment and as I sit on the train watching the trees take on the start of an autumnal tint, wondering whether I’ll finish the jumper before it gets cold enough to need it, and thinking about this little winter baby kicking away inside, my fingers settle into their familiar rhythm; knit knit, purl purl, knit knit, purl purl. It’s the speed that varies. On the fast train in the morning my sleepy fingers take a little time to warm up but then catch up with the rattle of the carriages as we whistle through the stopping stations. On the way home with my mind still racing from the day I start off quickly, knitting out my worries and frustrations, and as the tension drops away with each station call, so does my speed, my fingers settling into the rock of this quiet little local train to bring me back where I belong; curled up on the sofa in the nearest approximation of a midwife-approved relaxing position, with a sleepy Kitty tucked up in bed upstairs, talking to H about all the nonsense under the sun, as the yarn slips through my fingers and the teacake supply steadily dwindles away.